With the drop ship program, Transline ships orders on your behalf directly to your customer. It is difficult if not impossible to inventory all coin products. That is why we encourage you to think of Transline as a storehouse for your inventory. Assume a retail customer wants to buy a Liberty dime album, but you are sold out. With the Transline Drop Ship Program you now have the flexibility to complete the sale and have Transline ship the product directly to your customer. The Drop Ship Program is an easy way to augment sales while offering your customers all the convenience of a full-service coin shop. Get your company name out there! Transline offers a variety of products with customizable features to help promote your company and retain the loyalty of repeat customers. Getting your brand recognized through custom printed products is simple and easy. Selling bagged coins or 90%? Print your company information on your cloth money bags and ensure that your customers keep coming back for more. Transline can custom print inserts for 2x2 coin flips. Some of our more popular customized products include foil stamped storage boxes. We can even print your company's information on any of the Guardhouse wood boxes. Quantity minimums do apply. In addition to custom printing for larger orders, we can also custom engrave individual Guardhouse wood boxes on a piece by piece basis. Give us a call today and let us know what you would like to customize. Chances are good that we will have a solution for you! Still have an old version? 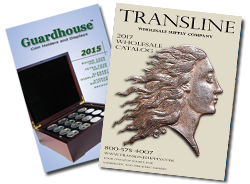 Call us to receive your FREE 2017 Wholesale Catalog today!